If you own a pickup truck, see kayak racks for trucks. If you need a trailer, see kayak trailers. It’s one thing to pick up the coolest kayak in the world at a store near you and another thing to transport it to your destination. Whether you’re planning to take home your first kayak or venture to a remote location for the adventure of a lifetime, you’ll need a convenient and safe way of transporting your kayak. If you are a new kayaker, you’ll be especially worried about the kayak flying off during transportation or about how you’re going to lift the boat off your vehicle and onto the ground without doing further damage. You could always buy plenty of rope and strap it to the roof of your vehicle, but chances are you’ll end up damaging both your best sit-on-top kayak and your roof in the process. If these are your concerns be rest assured that this article will help you handle those initial anxieties and offer a hassle free, repair-free transport experience. The most important gear you need to own for safe and convenient transportation is a kayak rack, also known as a kayak carrier. With the sheer number of models available in stores, maybe you’re not quite sure where to start. Well, read on to learn a little bit more about the different types of racks and which ones are likely to suit your needs. If I had to pick one kayak roof rack to recommend above all others, especially on a modest budget, the crown would go to the Malone Downloader. Although not as famous as its competitors Thule and Yakima, Malone makes some of the highest quality racks on the planet, and their J-style line is the perfect general purpose roof rack line to meet the needs of pretty much any paddler. I prefer their Downloader model personally, as it offers very solid support for my kayak with its exceptional quality at an affordable price. And if you want more proof, there are over 300 reviews on the Amazon with an average of 4.5 stars to back me up. Note: Although they are essential for the use of kayak carriers, the crossbars can also be used without any attachments. In that case, they should be properly padded (see temporary pads). You usually place the kayaks upside down on top of the rack and strap them with ropes to the bars. 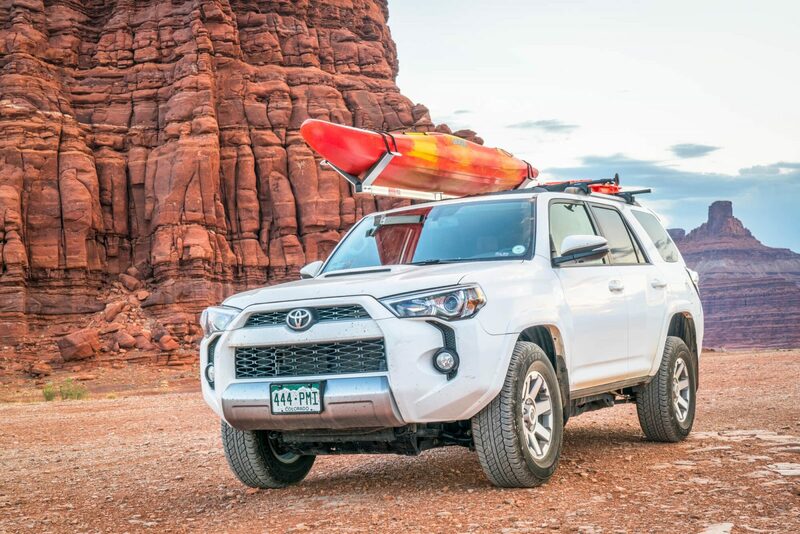 Choosing the right kayak rack for your car is never easy. There are a number of factors that you need to evaluate when choosing the roof rack that best suits your needs. In this guide we discuss all the specific needs of kayakers and how to choose the gear that meets those needs. What’s your car’s base roof setup? If your roof is naked or is only fitted with side rails, then your only out-of-the-box solution for carrying your kayak are inflatable or foam pads. This is because there is nothing on the top of the car to attach the gear mount to. If you want sophisticated carriers that are specifically designed for the business of carrying kayaks, then you will need crossbars. If your car comes with factory crossbars, you can move to buying one of the gear mounts designed for kayaks, such as saddles, j-cradles or stackers. However, be sure to check to see if there are weight limitations on factory fitted crossbars. If there are no crossbars, then you will need to purchase a set of these excellent rook rack crossbars. How many kayaks do you plan to carry? 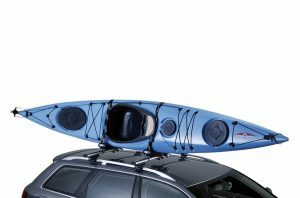 The number of kayaks you are going to transport is another big factor to consider when deciding on a roof rack. Basically, if you don’t plan to carry more than 2 kayaks, most solutions will work for you as double kayak roof rack. However, if you plan on carting more than 2 kayaks, stackers are definitely your best pick, since they allow maximum boat capacity. This is limited only by the width of your vehicle’s roof and the size of your crossbars. So if you own 2 kayaks and own a car with a narrow roof, my suggestion is that you pick a pair of j-cradle sets. Do you plan long-distance driving on the Interstate? If you plan to travel cross-country to seek out other lakes and coasts, you’ll probably want a more solid and secure solution. If that’s your situation, avoid foam or other temporary pads. In extreme conditions, such as stormy weather or when driving on bumpy roads, you’ll need to wrench down the temporary pads very, very hard which can damage your kayak. If you don’t do that, your kayak may shuffle around on top of the roof or the foam pads may blow right out from under it. Solid roof rack systems such as saddles and j-cradles are the best fit in this case. How often do you intend to kayak? If you paddle every day, you’d want to spend as little time as possible loading and unloading your kayak. A pair of saddles on the front of your rack and a pair of rollers on the back will be one of the most convenient kayak hauling systems to use. Some paddlers even find side-loading j-cradles easier to load and unload. The bottom line is that with a good roof rack system, convenience is the real pay-off. While some SUVs come with factory racks, many vehicles don’t and as far as cars go, you’ll more than likely have nothing at all. Since temporary pads don’t require any base rack system installed on your car’s roof, they come handy in this naked roof kind of situation. Beside, they are pretty easy to install and remove. Temporary pads basically consist of straps that go around the inside of your car along the roof and over the top, where they are attached to foam or inflatable padding. The temporary pads are really only suitable for short trips and for those who don’t transport the kayak too often. They are not suitable for speedy travel! However, if you want a quick and cheap solution to moving a single kayak to your local river or lake – then temporary pads are perfect for you. 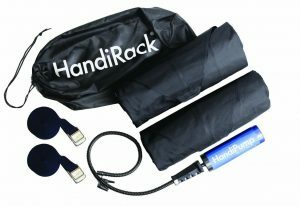 Malone HandiRack Inflatable – The best temporary pads on the market are Malone HandiRack Inflatable. They are a perfect solution for carrying a single kayak. The inflatable pads protect the roof of the car and the kayak brilliantly. You receive a hand pump, to help with installation. Perfect for carrying furniture, luggage as well as sports equipment. This inflatable roof rack comes with a travel bag and load straps and is reviewed as ultra-convenient and hardy. Saddles are pads that extend from your base rack to the bottom of kayak – either as a single cradle or two separate pieces that adjust to the width of your boat. The biggest advantage of a saddle is that it provides a bigger surface for the kayak to rest on when on top of the car. Another reason to select a saddle is the additional security offered – meaning you can travel through storms and heavy winds and know the boat will stay put. Finally, it uses the aerodynamics of the kayak to cut down on wind resistance and therefore noise and additional fuel costs. Malone SeaWing – One of the best saddles on the market is the Malone SeaWing. 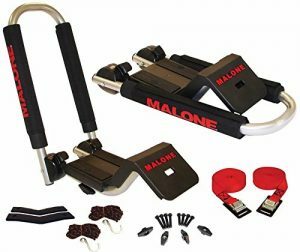 Malone is one of the top brands in roof racks for sporting equipment, and this saddle is the top of the range. The name of the SeaWing is appropriate, as the brackets are shaped like the wings of a bird. The brackets fix to your base rack and the kayak sits in the cradle. There are then straps that are wrapped over the top of the kayak. It supports only 70lbs – but you are only going to be carrying one kayak in this rack. 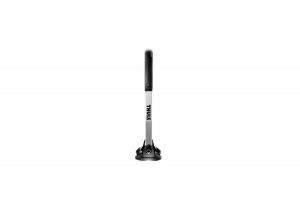 Thule DockGrip – Another possibility is the Thule DockGrip. 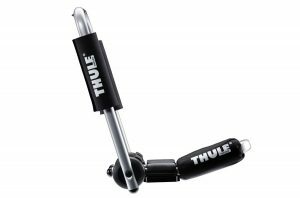 Unlike Malone, which is a company that is quickly expanding, Thule is a market leader. The DockGrip, like the SeaWing, fits to a base rack, however there are four brackets that the boat sits between. Less of the hull is held by the carrier, but this means they carry a wider range of hulls – thanks to its angle-setting lever. 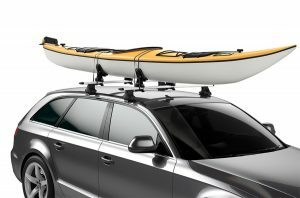 J-cradles or j-style kayak racks are the world’s most popular kayak roof racks and are called so because they are designed in the J shape form. J-Style cradles are side-loading racks, sitting at about 45 degrees angle on your cross bars, leaving you with more room to cart other adventure gadgets. If your vehicle has a narrow roof and you plan to cart a couple of kayaks, saddles and rollers won’t work as they haul the kayaks in a vertical position. J-cradles on the other hand are very stable and secure and fast to load and unload as well. You don’t have to load your kayak from the back of the car, instead you can just pick the whole boat and side-load it. Just keep in mind that if you own a heavy kayak, you may have trouble finding the strength to haul them sideways. This is especially true when the weather is rough or when you have exhausted all your energy from hours of kayaking. J-cradles are therefore not ideal for paddlers who are short or too old to lift the boat to the roof of the car. Malone Downloader – There is a lot of choice on the market when buying j-cradles. The best in the field is the Malone Downloader. Again, Malone makes it to the top of the pile for creating racks that are perfectly designed for transporting kayaks. 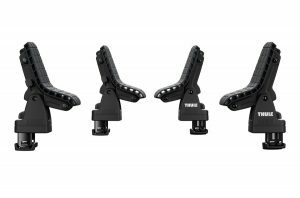 The JAWZ technology is what sets this rack apart. This mounting technology allows you to fit the j-cradle to round, square and most oval shaped factory installed cross rails. Yakima JayLow – Another option is the Yakima JayLow. Here you can really see why the j-cradles are the most popular rack for kayaks, as this looks sturdy and secure. The support the boat gets is greater than you would get with other racks of this type – though loading the kayak might be difficult for shorter or older people. 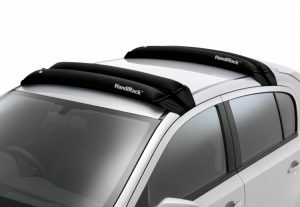 folds down and locks in the down position for additional security – allowing you to leave the rack on your roof. 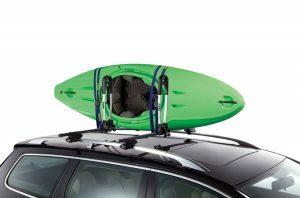 Thule Hull-a-Port Pro – As the j-cradle is such a popular variety of roof rack, there is a lot of choice available. Another option could be the Thule Hull-a-Port Pro. 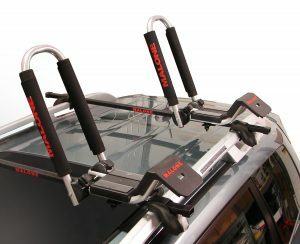 This j-cradle kayak carrier fits to all Thule rack systems with round bars and most factory racks. 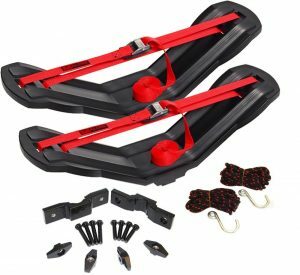 It comes with two ratcheting bow and stern tie downs and straps, with buckle protectors, to prevent damage to the car and the boat. more room on your load bar for other kit. Stackers arrange your kayaks in an upright position on their sides, taking up about 50% less crossbar space per boat thereby offering maximum boat capacity. You can simply carry the kayak and stack it against the post or against another kayaks. Typically this means that you can carry as many as 4 kayaks on top of your car. Another reason to choose stackers is that they are inexpensive but secure and easy to install. They work well with any type of kayak, with the exception of kayaks with very wide tandem sit-on-tops. 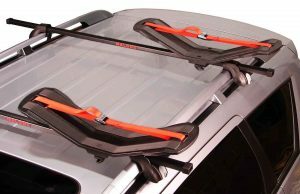 Thule The Stacker – The best stacker kayak car rack on the market is the Thule: The Stacker. Made from steel, with a non-scratch outer coating, this kayak carrier is the ultimate in fast installation and removal from the car. easy to use, straight out of the box! Malone Stax Pro2 – Another option is the Malone Stax Pro2. 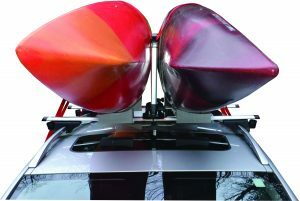 This universal car rack folding kayak carrier is capable of carrying 2 boats at a time on the standard car roof. It can be used with most roof racks – whether round, square or oval. This is a strong, stable design that can carry up to 80lb of kayak at a time. The foam padding keeps your boat scratch free and the bow and stern tie downs keep it secure to the rack. This is an excellent piece of kit! There are many companies that make kayak roof racks but choosing the right brand depends largely on what you intend you use it for, your experience and your budget. While most of the top kayak carrier brands share plenty of features that are common to each other there are still differences that make each brand stand out from the rest. Some have created special features that make their racks better in certain aspects, and some have an all-round aspect to their products that puts them on top. Understanding these key differences is helpful in choosing the right kayak for your needs. That said, here is a list of the best kayak carriers in the market today. Thule was founded in Sweden in the year 1942 and is the first company in the world that made it possible for car owners to transport their own sports equipment and luggage by themselves. Since its inception, Thule has expanded to provide a complete range of car rack products for different models of cars and for different types of outdoor activities. Yakima, one of the world’s leading brand of car racks made its humble beginnings as a small machine shop in Yakima, Washington. Today, it produces some of the world’s best products that are available both under its own label as well under the popular Whispbar and Prorack brands. Currently operating out of Portland Oregon, Yakima continues to pioneer innovative designs in the industry in keeping with changing cars and gears. 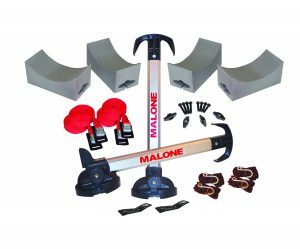 Malone Auto Racks is one of the fastest growing rack accessory companies in North America with stores located across the United States, Canada, Australia and Europe. Operating from the Coast of Maine, Malone has over 10 years of industry leadership and experience. It has many firsts to its credit including the introduction of the “J” style kayak carrier and the first company to offer economical load assist modules for single person loading. Although TMS is not a pioneer in the industry, many of their products are listed as best-sellers in several kayak-related categories on Amazon. Over 900 mostly positive reviews make them the #1 candidate for purchasing kayak rack accessories. Need a car rack for a kayak,But my car do not have built on racks,what type can I use with no bars on top of my auto? You can use any kind of temporary pads, like inflatable or foam. For specialized carriers you would need bars installed. I have 2004 Camry with a sunroof where can I get a roof rack the top is bare. With a Thule kayak roof rack, you re all set to get the most out of your passion. Instead of a cumbersome trailer, you get a kayak car rack that is easy to load and unload as well as ensuring safe and secure transportation of your kayak. You can even choose between horizontal and vertical carrying positions to save space and carry even more kayaks. I have a double sun roof on a chevy Malibu. I’m short 5’2″ . I don’t have the greatest upper body strength. What kind of rack would be best? Integrated lift systems are the most expensive option, featuring roof racks and automated lifts to pull the boat into place for transporting. Love your review. Very helpful. I do however have one question that you did not address and that is: “Are there any good kayak carriers that can be attached to a luggage rack?”. I own a Jeep Unlimited Rubicon and am shopping for a luggage rack to use for hauling hunting gear and would find it very laborious to have to remove that rack in order to load my kayak when I return from a hunting trip. I have a Murano s Nissan 2017 without roof rail. What is the best rack to this suv? Hello. I have a 22ft seda tango tandem kayak. I have tried many iterations of Yakima hully rollers and Tule slide pads. No of them have been a good fit for a large boat. The saddless flatten with drive time. The wheels and pads leave dents and marks in the hull. Any suggestions on what mount system might fit and secure my kayak. It is 21 ft long beam is 29. V hull front and rear. Flat midsection. I own a 2012 GMC Acadia. It has the factory side roof rack. We bought 2 sets of J Cradles/Hooks, but they won’t fit onto the roof rack. We don’t have cross bars. Is there any J Cradles that will fit on to the existing rails or do we also have to purchase cross bars, then attach the J Cradles? We have 2 Kayaks, that are 10ft. Yes, the cradles must be attached to a cross bar to work. 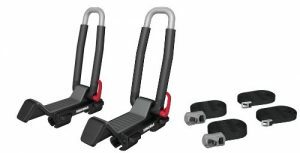 For your vehicle I’d recommend a pair of Yakima’s medium CoreBars w/ TimberLine Towers. Hello. We have a Subaru Forester and are looking to purchase and transport 3 smallish covered-deck kayaks. What do you recommend for a rack that will carry all 3 kayaks? Our Sub has a factory roof rack but we have none of the rack accessories (at least so far). Thanks for your help. 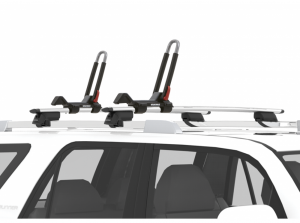 If you have factory bars already installed, the ideal solution would be two sets of Thule Stackers (or at least one set) and place the kayaks between them simultaneously (U|U|U). Be aware that one set includes all straps to transport 1 kayak, so you’d probably need additional straps to complete this set. Welcome to KayakRoofRacks.net, the web’s best resource for information about kayak racks of all kinds! It specializes in providing in depth analytical content that will help you make the best decision possible when purchasing your next kayak rack. If you would like information about a topic that you don’t see covered on my site, shoot me an email and let me know!